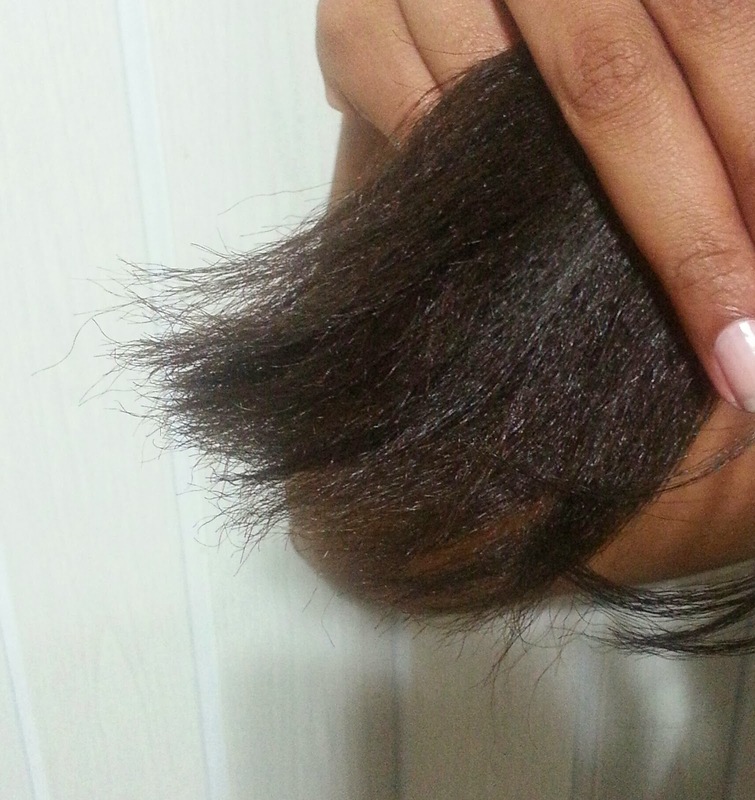 Healthy Hair Diary: Trim Turned Haircut From Hell! 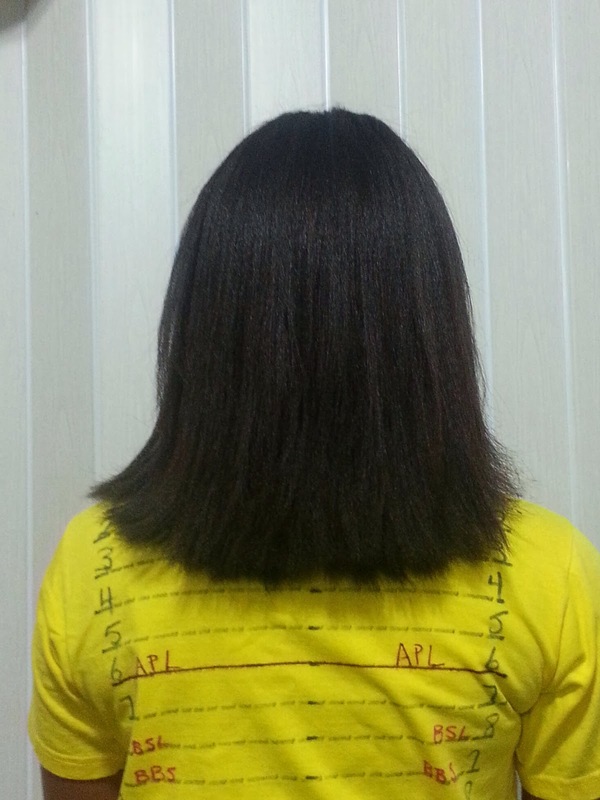 I could not wait to get rid of the space at the centre of my nape since I am all for health before length, I felt like I had enough growth to get rid of my uneven ends and still have a reasonable amount of hair left, I fully expected to lose some length but linger somewhere around APL (Arm Pit Length). I was both excited and nervous but still opted to get my hair trimmed at a salon since I wanted a fresh start for 2014. The salon I went to was Jean Paul Unisex Salon, when I got there a young lady wanted to wash my hair and I told her no, all I wanted was a haircut and I did not need 10 people’s hand in my hair to get it done. I ask that Jean Paul do everything or I don’t get my hair cut that day. I waited until he was finished with his client then he proceeded to shampoo then condition my hair with Rusk Deepshine Smooth Keratin Care Smoothing Shampoo and Conditioner. Before he started I showed him the picture of my hair and he suggested layers which I refused, I showed him where I wanted my hair cut to, both in the picture (line 6) and on my body, I also asked for a blunt cut. After he was finished washing my hair I asked for a roller set only to learn that he don’t do roller sets, he has not one roller in the salon! I was shocked beyond belief; I never expected a salon to not have rollers! I had to meet a friend after so it was either leave with my hair wet or blow it out. From the picture you can see that he clearly ignored what I asked for, he is a very scissor happy stylist who also loves to use too much heat. There were times when I had to stop him from redoing sections with the blow-dryer because he was trying to flip the ends of my hair since I told him I did not want my hair flat ironed after blow-drying. 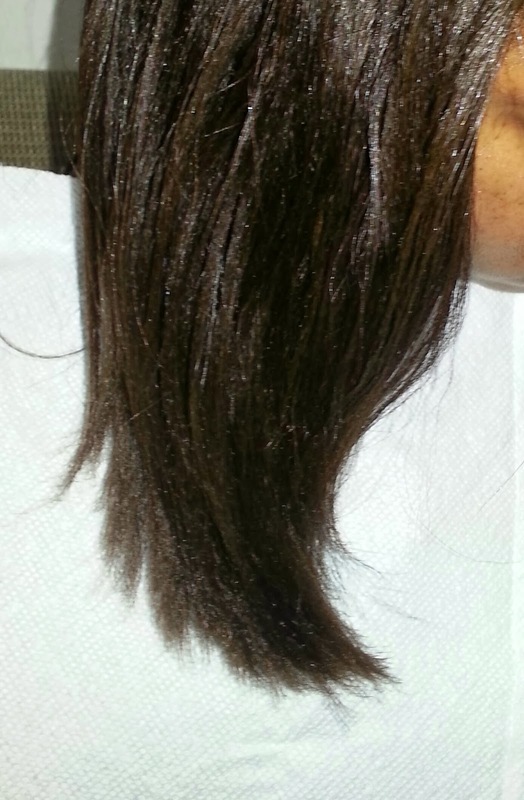 I went to the salon for a simple blunt cut and came out with SL (Shoulder Length), U-shaped fried ends! As you can see from the pics my ends are dry, it feels very coarse and looks horrible and no amount of moisture I put has made it look or feel any better, I will have to cut some more again, at least an inch. My hair has NEVER felt or look like that after a hair cut/trim. As if all that was not enough, five minutes after leaving the salon my scalp started to itch like crazy so I take a look in my car mirror only to see my scalp white! I have no scalp problems so I knew immediately that it was because my hair was not washed properly, I still had shampoo on my scalp! I had on black pants, when I looked down I had a white coating on my lap. I had to go home and oil my scalp before going to meet my friend since my scalp was on fire from me itching it; she had to wait quite a while for me. I went to the salon on Tuesday evening and paid TT $280 for the crap that I got, I had to wash my hair the following day because of the issue with my scalp. I had hoped that my ends would feel and look better after the wash but it did not also my nape is now my problem area again since it did not revert when I washed my hair, it stayed bone straight. I now feel like the 19 months that I’ve been on this journey just went down the drain, I am now back to the length that I was at last November. I need to trim my ends again but I am going to hold out as long as I don’t get breakage. I know my hair will grow back but I am still mad. I intend to do all cuts and trims myself from now on. This is officially my first set back, I am down but not out, the journey continues! Do you have any advice for me? Leave me a comment below. OMG! Candice! I am so sorry about your experience. I could not believe my eyes when I saw your after pic of the cut. He went way over the top. For a blunt cut you should definitely have been at APL like you intended. I am angry for you! As far as your ends, baggying them may help or otherwise keep m&s-ing. You will bounce back from this for sure! I never tried bagging before so I'll give it a try like you suggest. I am even going to give the inversion method a try to see if I can gain a little extra growth, I am very skeptical of it but at this point it's not like it can hurt. I fully intend to bounce back from this, thanks for the support Andrea! OMG. I literally GASPED OUT LOUD when I saw your second picture. My heart truly went thru my laptop screen out to you! I demand that you go back and read MY comment to this so-called professional! It is absolutely absurd for anyone, regardless of experience or ethnicity to cut multiple inches from a client's head when they asked for a TRIM. He should refund your money and offer a future deep conditioning session for free (not that you would dare accept another service from him). 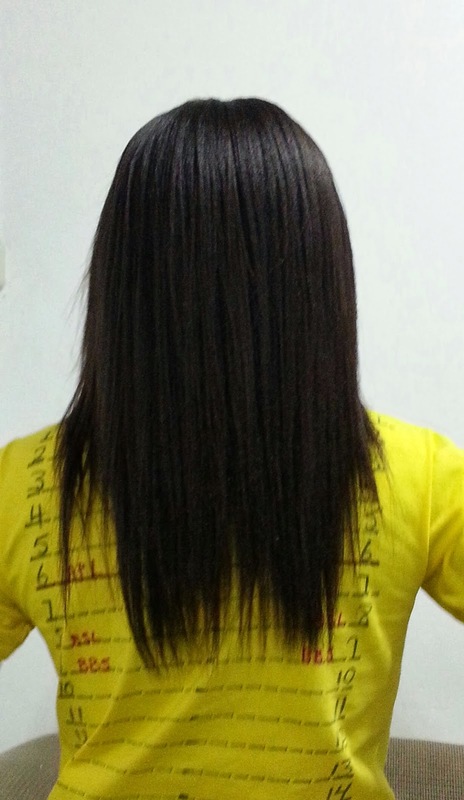 As for your hair, although it is the same length as your starting point, the thickness is amazing! So bright side? I hate that this happened to you! Your ends will surely bounce back, try a porosity treatment to help retain moisture in the ends and I agree with the baggying suggestion. I'm currently wigging for maximum length retention - maybe you can do that for a few month until you get some of your length back? I hope it works well for both of us. Smh, I am just sick over this for you BUT you can and will come back! This is not the length I wanted or expected but it is the thing I'm least angry about because I know my hair will grow back, the resulting health of my hair and all the other things is what I am really pissed about! I did let him know that I was not pleased even before he was finished and I am pretty sure he knows he will not be seeing this customer or anyone I know willing to listen again! You are right about me not accepting any other service from him free or otherwise! I can't even put my hair in a high bun because my nape is 4 inches from root to tip so it does not reach. I will try bagging and the other things you suggested and of course my wigs will be making a comeback big-time! Your after picture is shocking Candice!! My heart dropped. I'm so sorry this happened to you. I am angry and saddened for you. It's so crazy and completely WRONG that a stylist would completely disregard your request like that! Ugh! I do not, however, think your past 19 months went down the drain. Looking at your pic from a year ago, your hair looks so much fuller, thicker, and just healthier! So you have accomplished the aspect of health even if your length was just stolen from you. I think you can definitely bounce back from this using the above suggestions: baggying, keeping your porosity in check, protective styling plus maybe some extra deep conditioning sessions. I would try doing those for awhile before deciding if you should cut some more. I'm sure your hair will recover! Thanks Melanie, I am confident that I will recover because I am a lot more knowledgeable than I was 19 months ago. I usually deep condition once per week but I will try to fit in a mid-week DC when I can. Right now my plan is to try a few things this stretch and see how they work since I prefer to cut at my next touch-up. What is it with French guys and great hair cuts? He did a wonderful job. Your hair looks so healthy now. He is not French, he is Spanish lol Healthy and wonderful is the opposite of what I would call it. OMG Candice, my heart is breaking and its not even me. I sooooo dislike scissors happy stylist and their version of an inch is really 3inches. Your ends are really full now and your hair will definitely bounce back. I still can't believe your after pic but let's look to the future of your hair. Thicker fuller ends for 2014 and beyond. Nothing to do now but look to the future, 2014 here I come! Oh my goodness! Oh my goodness! (Shananay's voice). I had to go back and look at your before cut pic to try and grasp why he thought he should do what he pleased, smh. The suggestions I would make to aid with your ends have already been made multiple times, but chin up, you'll bounce right on back. I know what it feels like all too well. LOL @ Shananay voice! I loved that show! If it was just the length I lost I would not have called this a setback but OMG my ends are horrid! There is no ifs or buts I have to bounce back from this! OMG Candice! I can't believe he did this to you. I was so shocked with the amount that was cut off. If it is any consolation, your hair looks thick, healthy and full. I think it will grow back in no time and you know exactly what to do to get there. I guess for next time, you could do several consultations before deciding on a stylist that will trim your hair. I don't see myself visiting another salon any time soon, I intend to learn to trim my hair by force. At this point I trust my nine year old daughter to do hair services more than any "professional". Wow, Candice. This is so shocking! I'm so sorry about this. I can't believe that he could follow your instructions. You even gave him pictures with clear guidelines. I don't have any specific hair advice about your ends, but if you did it before, I know you can do it again! You will bounce back from this. Happy Hair Growing! Thanks fancyflairlady, it called a journey for a reason right?! The cut does give your hair a thicker look, I agree that is the bright side. I love to baggy, your hair will love it too! Thanks Ali O, I hope so. I can't believe this! Wow be strong girl cause I would have gone on a bawling spree for days mourning my loss. I have no choice but to move on, we live we learn right?! This is awful! I would not have paid him a red cent! I cannot understand what made him think that was okay! I am angry for you! He should be the poster boy for scissors happy stylists! The only consolation is that it can an will grow back! You can do this! Best of luck! Omg, so sorry this happened to you. I do not understand why hair stylists fail to listen to their clients especially when it comes to getting a trim/hair cut. This makes me so angry! I am wishing you all the best for the rest of your hair journey. Thanks Shereen, the journey continues. OMG Candice I am so mad on your behalf right now! What the heck? I am so sorry that this happened to you he should definitely refund your money because he clearly did not follow instructions! This is just so wrong typical case of stylist who think they know their clients head more than the clients themselves. I was thinking of getting a professional trim in January but I am so scared to let anyone with scissors in my hair right now. But not to worry with a lot of protective styling and babying your ends you will be back to your pre trim length in no time. Try the inversion method I have seen other bloggers results so I believe it works but read up on it first though because it is not advisable for people with certain conditions like high blood pressure etc. Wow this is one scissor happy stylist this is so wrong on all levels! I have a few choice words other than scissor happy to call him lol I plan on trying the inversion method, I am still skeptical but it can't hurt. My mouth dropped OPEN when I saw your after pic! Lo siento chica, your hard work wasn't in vain though. Because you know exactly what to do to take great care of your hair. It will grow back faster, thicker and stronger. Sidenote: When you're ready to laugh about this, check out this pin: http://www.pinterest.com/pin/514043744939336200/. I am sooo ready to laugh about this!! I can't view that pin for some reason, not gonna give up until I do!!!!! Don't worry, I understood every word you did not say lol. Thanks for stopping by Harlem! That is terrible! Sorry you had to go through that. It is stylist like him that make it hard to trust any so called professional stylist. I went to a stylist and allowed her to cut my hair in layers. I already figured she would cut off too much which she did. I needed that cut to get rid of terrible ends and bone straight relaxed ends but I would never let her put scissors to my head again!! I know u will not have a problem growing it back. We are in this together, healthier hair for 2014 and beyond!! I might have to go as far as to blacklist all stylist, I won't say they are all bad but it seems like all the bad ones live here lol we will bounce back, there is no other option as far as I'm concerned!! *sidenote* I have not been able to view your blog on my laptop for quiet some time now, thanks to your comment I realized I can view it on my kindle. I nominated you for the Liebster Award, I left a message for you on facebook since I didn't know how else to contact you. Oh no!!!!!!!! This is the first time I've stopped by your blog and I find this? It is complete devastation to the nation! I would have been in prison with you!!! Honestly, I haven't been to a stylist for a trim in 2 years and don't plan on going any time soon. I prefer to gap my own hair up instead! Next year I'll be sure to do a "this day in history" post lol...... to growing it back plus some! Thanks for stopping by Ineller! I'm so very sorry you have endured this. I cannot see the damaged ends from the pics. I say leave it be and keep it moisturized & conditioned until you regain some length. Maybe try protective styling to alleviate some of the stress on the hair. I don't have any suggestions for the nape but hopefully it will revert and you recover well. Again, I'm very sorry but don't get discouraged. Hugs! Thanks for stopping by Divachyk! I'm thinking about doing long term protective styles for the whole of 2014 but haven't made up my mind yet. I'm not about to give up though, this journey only just begun! I'm so glad to hear you say that. We will keep you uplifted and motivated. We must stick together and overcome challenges. I've had my share of setbacks. I have protective styled my way back from each and every setback. One of the best things about blogging is the love and support you get, thanks again Divachyk. Must have been a terrible experience!! This hairdresser seems insane. However, I must compliment you on the blunt thick ends. Maybe the dry ends you are worried about are not so visable in the photo but to me it looks fantastic. It looks like those expensive wigs that a lot of news anchors on TV use. Seems so thick and even and I can think of so many different hair styles you can do for NYE and you will be competing with the fireworks when it comes to attention! So sorry dear ....must have been a terrible day for you. But we always rise again stronger I can't imagine how you felt because when I had my damaged SL hair cut to NL, I wept and wept and wept....LOL!! Thank God it turned out to be a blessing in disguise as it marked the beginning of my hair journey....Now I'm APL after just one year. When I first saw this I went OMG!! OMG!! OMG!!OMG!! ......Oh My God!!. I was too shocked to put up any reasonable comment back then. That "barber" .......I tell you would have been the worst day of his career. But fingers crossed, you'll be back to that length in no time. Fingers crossed indeed! Bigger and better for 2014! I was reading up your posts that I had missed, and I was so excited for you when I saw your relaxer update blog and now reading this! I cannot believe he actually did this. But just take it as a positive step, if you can, your ends are blunt and your hair is thick. Oh Candice…it was a salon experience from hell! I am working hard to maintain my thickness, if all goes well for this year I will be full APL by the end of this year with amazing thickness from root to tip!